WASHINGTON (AP) — Right-handed reliever Kyle Barraclough was acquired by Washington from Miami on Wednesday in the Nationals’ first offseason move to rebuild their bullpen. 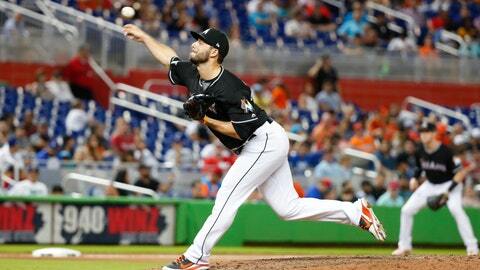 Washington sent the Marlins $1 million in international slot allotment as part of the deal. Barraclough went 1-6 with 4.20 ERA and 10 saves in 17 chances during 61 appearances this year. He allowed one hit in 36 at-bats in June, when he was chosen NL reliever of the month, but struggled with his command the rest of the season. Barraclough’s ERA ballooned to 10.24 over his final 24 games and he lost the Marlins closer’s job. His fastball average velocity dropped from 96.5 mph in 2016 to 94 mph this year. He has a 3.21 career ERA with 279 strikeouts and 134 walks in 218 2/3 innings over four seasons, all with Miami. Washington general manager Mike Rizzo is in need of relievers after jettisoning Shawn Kelley and Brandon Kintzler late this season. Miami obtained greater financial flexibility to pursue 22-year-old Cuban outfielder Victor Victor Mesa, an international amateur free agent who showcased for major league scouts at Marlins Park last week. Miami started with $6,044,500 in available allotment for its 2018-19 international signing bonus pool, has increased it to $8,044,500 and has spent $1,975,000, leaving $6,069,500 remaining.